Anton Chekhov wrote: It is a common saying that a man needs only six feet of land. But surely a corpse wants that, not a man. And I hear that our intellectuals have a longing for the land and want to acquire farms. But it all comes down to the six feet of land. To leave town, and the struggle and the swim of life, and go and hide yourself in a farmhouse is not life -- it is egoism, laziness; it is a kind of monasticism, but monasticism without action. A man needs, not six feet of land, not a farm, but the whole earth, all Nature, where in full liberty he can display all the properties and qualities of the free spirit. My brother Nicholai, sitting in his office, would dream of eating his own schi, with its savoury smell floating across the farmyard; and of eating out in the open air, and of sleeping in the sun, and of sitting for hours together on a seat by the gate and gazing at the fields and the forest. Books on agriculture and the hints in almanacs were his joy, his favourite spiritual food; and he liked reading newspapers, but only the advertisements of land to be sold, so many acres of arable and grass land, with a farmhouse, river, garden, mill, and mill-pond. And he would dream of garden-walls, flowers, fruits, nests, carp in the pond, don't you know, and all the rest of it. These fantasies of his used to vary according to the advertisements he found, but somehow there was always a gooseberry-bush in every one. Not a house, not a romantic spot could he imagine without its gooseberry-bush. Gooseberries have existed for some time on the edge of my consciousness, as something once familiar in the midwest kitchen-- 60 or 100 years ago-- but now rarely seen even as jam. For all I knew, they were like true American chestnuts, a once significant source of nutrition wiped out by some blight. In fact they are more like black walnuts, easy enough to find-- but too difficult for our food industry to handle profitably, possessed of a thin stem at one end and a tuft of dry husk at the other, both of which must be snipped away by hand. Spending a good half hour trimming a pint of them will make you realize how much fruits that were once exotic in the midwest, like tangerines or bananas, have benefited from being convenience foods, every bit as much as pizza puffs or Go-Gurt tubes. Theodore Dalrymple wrote: As a child, I thought them an inferior fruit. In part, this was because of their color: pale green, while I thought that a real berry ought to be red. Also, they were extremely sour: so sour, indeed, that—as the Germans say—they draw the holes in your socks together. For some reason that I now cannot recall, I conceived the idea early in my life that it was weak and ignoble to sweeten fruit with sugar. Even now I experience a vague feeling of guilt on doing so. If God created gooseberries sour, it was because He wanted them eaten sour. But the key point was, VI had seen them at his farmer's market and there was a chance that I might find them at mine, if I hunted, if I poked around, if I quizzed the sellers about the season and when they might be ripe and begged them to save some for me and... oh here they are. "Try one," one of the farmers at Green City Market said. I picked off the stem and put one into my mouth. It popped like a grape, it tasted like... a tortilla. I'm not kidding here, in fact my son, unaided, made the same comparison when he ate the final result a week later. There's a corn tortilla note in gooseberries-- at least in the American variety I bought (probably Welcomes), which are clearly less tart than the English/European sort eaten by Chekhov's narrator and the dyspeptic Dr. Dalrymple. The primary fruit flavors are so burned into our consciousness from an early age that imagining another flavor in between orange and strawberry and grape is as hard as imagining a new color between yellow and green and blue; few distinct new fruit flavors come along (who can really say what the flavor of kiwi or starfruit is?) and we struggle to assemble new flavors out of impressions of the old ones (lulo is orange, lime, a little pineapple). So what is gooseberry, besides tortilla? 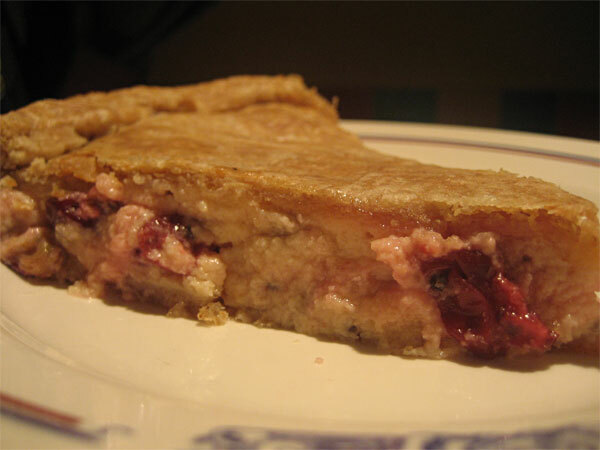 In sour cream custard, at least, it was like strawberry rhubarb pie with only one fruit, tart and sharp; somewhere between grape and cranberry, perhaps. A dry, laconic fruit well suited to dry English wit and midwestern resoluteness, the sort that pioneer folk would have considered a judicious gift from a stern God who didn't want people getting any idea from their fruit that life is lush and sensual. I'm going to look for two pints next time. Maybe I've already missed the season, I don't know, but I'm going to give it a shot. I like a fruit that doesn't jump in my lap and lick my face but keeps its secrets and plays a little hard to get. We cannot know the sweet without the tart. Thanks for doing much more thinking about the gooseberry than I ever have; I’m inspired to eat some, though I’m fairly certain I have never eaten a raw one. As I recall, my only encounters with gooseberries have been in jams, where sourness was the overriding sensation (not in a bad way). About the tortilla flavor, I wonder if what you and your son are connecting with there is the slightly acidic notes of a tortilla (more the result of liming than of the corn itself), yielding a slight sourness shared by the berry. I’m not usually a fan of fish with fruit, though fish and lime is, for me, a tasteful combo, so why not fish and gooseberry, perhaps even in a ceviche-type preparation? Could we promote the GNRs later and let our weekly tagline be “a judicious gift from a stern God who didn't want people getting any idea from their fruit that life is lush and sensual”? Getting ideas from fruit is, indeed, hazardous to one's eternal soul. why, just last night I was curled up with my tattered old copy of "Cooking by the Garden Calendar," published in 1955 by Ruth Appleton Matson (who also happened to hold down the post as Associate Director of the Cleveland Mental Health Association) and in the chapter for July, subtitled "Start Picking," she enthuses about gooseberries and how verasitle they are. Her first recipe is for a Fool, then for old-fashioned four-fruit jam and then she provides a Spiced Gooseberries recipe (to accompany meats) as well as a Gooseberry Chutney. If you would like these recipes, PM me and I'll happily get them to you. (I also saw her book used on Amazon for about $4, if you like to cook based on what you grow or get at farmers market, and you like a matter-of-fact encouraging narrative to go along with it, this is the book for you.) By the way, if a recipe says to "head and tail" the berries that means remove the stem and blossom ends. Thanks for the inspiring gooseberry post! Lovely-looking gooseberries were spotted yesterday at Marketplace on Oakton. 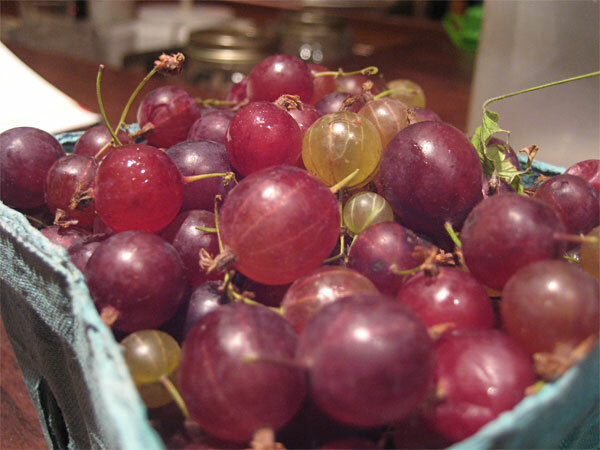 They also had red currants and some beautiful champagne grapes -- tiny and delicate. Don't you just love Theodore Dalrymple? So I was at Green City today and found the same vendor offering gooseberries again. 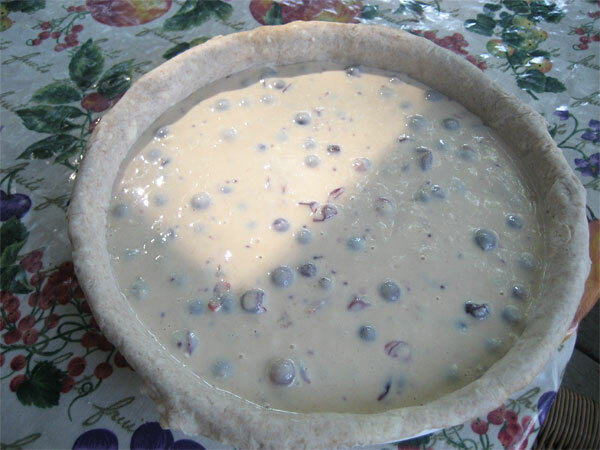 Went up to them and five-almost-six-year-old son, who had not been very fond of the sour cream and tart berry pie, said, "Can you not make that pie next? It's my last favorite of your pies."